Abbey Bar | Pub Quizzers | Find a pub quiz near you, now. 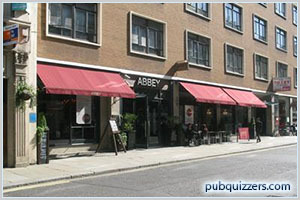 Pub quizzes take place at Abbey Bar, Tower Hill on Tuesdays (monthly) at 18:30. Entry is £0.00, you can have up to 8 people on a team. There are prizes of cash, drinks, food. Happy quizzing! Join us at Abbey for our Legendary pub quiz. The winning team will walk away with a £250 bar tab to use at Abbey, as well as a trophy to keep until the next quiz. Entry is FREE and complimentary nibbles are provided throughout the evening. What is someone who shoes horses called?